A new analysis of the Ebola genome shows the dreaded virus acquired several new mutations during the course of the 2013-2016 West African Epidemic, making it even better at infecting human cells. Two teams of researchers have published papers in the journal Cell (here and here) showing that the Ebola virus emerged from the West African epidemic stronger than before. A series of fortuitous mutations (well, fortuitous for Ebola at least) increased the ability of the virus to infect human cells. The virus, which is already highly communicable, appears to mutate quickly during an epidemic, allowing it to spread quickly. The two independent studies were led by Jeremy Luban from the University of Massachusetts Medical School and Jonathan Ball, a virologist from the University of Nottingham. The recent Ebola outbreak was unique in that it was the first opportunity for the virus to replicate en masse and infect tens of thousands of humans. Previous to this episode, Ebola outbreaks were short lived, so the virus didn’t have much opportunity to adapt genetically to its human hosts. But during the most recent widespread outbreak, the disease infected an estimated 28,616 people across 10 countries, killing 11,310. When the virus isn’t circulating through humans, it’s moving around in an unknown animal “reservoir,” likely fruit bats. It’s possible for the virus to acquire human-specific adaptations while circulating through bats, but the chances of this happening are exceedingly slim. 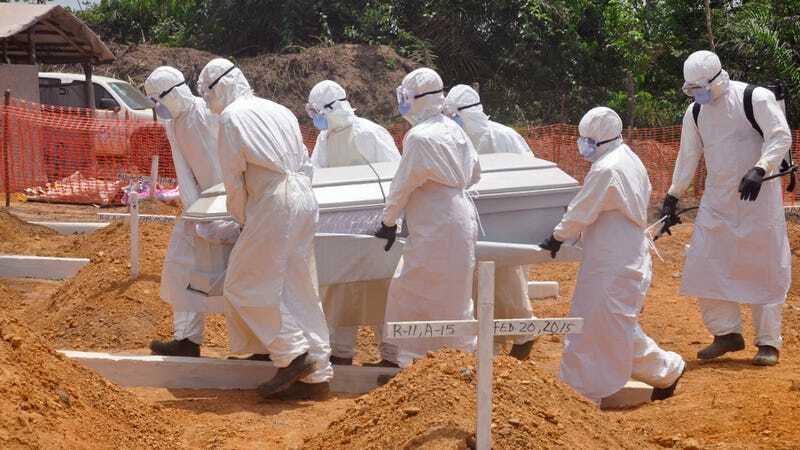 The West African Epidemic offered Ebola an unprecedented opportunity to use humans as a testing ground for its genetic experiments, and through the powers of Darwinian natural selection, it was able to exploit our biological defences. For the two studies, the research teams used publically available Ebola gene sequences to track any potential mutations. Their analysis uncovered mutations in the gene that encodes for Ebola’s glycoprotein—a protein that plays an important role in cell-on-cell interactions. This alteration to its genetic constitution enhanced Ebola’s ability to infect the cells of humans and other primates. Using infection models, the researchers were able to demonstrate the virus’s newfound skills on cultured human cells. The researchers say it’s possible that these mutations increased the spread of Ebola during the outbreak. And indeed, one particular mutation emerged early during the outbreak, and at a time when case numbers spiked. The new strain quickly became the dominant version. It’s not immediately clear if the mutated form of the virus still exists. Another possibility is that the updated virus leaked back into the wild, though that scenario seems unlikely given that the mutated form of the virus is now distinctly disadvantaged in non-primate cells. Luban’s research found that the mutation only increases Ebola’s efficiency in human and other primate cells, which is actually good news—these mutations did not increase Ebola’s ability to infect the cells of fruit bats, the likely source of human outbreaks. That said, this particular strain of Ebola might arise anew in future outbreaks, or different mutants might emerge. “What our studies show is that viruses better adapted to infecting humans arise quickly, and they can acquire further mutants to improve infectivity further and...play an important role in spread and severity of disease,” Ball told Gizmodo. Looking ahead, the teams would like to learn more about these mutations, how the virus infiltrates cells, and how diseases evolve over the course of outbreaks. Hopefully, that’ll put us in a better position when the next outbreak hits.